When your server seems to be offline or otherwise inaccessible, you should always be able to log in with the web console at your UpCloud control panel or through a VNC connection. Once logged in, test your server’s internet connection using ping and a public IP address such as Google’s public DNS server, which is most likely to reply provided your internet connection works. If the server is unable to reach the destination, there may be a problem with your configuration. Follow the steps described here in order to troubleshoot the most common network issues with Linux cloud servers. Make sure the network interfaces such as eth0 are enabled. To see all the configured interfaces, use this command. The output of the command will show the status of each network interface on the server with “state UP” or “state DOWN”, for example as below. Turn on any disabled interfaces with the next command. Here the interface name is one of the names listed in the ip addr command output like eth0, eth1 or eth2. When all network interfaces have been enabled, try using the ping command again. If the problem persists, check that the network interfaces have IPs assigned to them, and they match with the information on Network section of the UpCloud control panel. Try restarting any problematic interface with the following commands. If either of these commands fails, it is possible that the interface is in a state unknown to the command script. Try the same commands again with --force parameter to resolve any such issues. If restarting the network interface fixed the issue, great! If not, continue with the troubleshooting. In most cases the interfaces file should list at least the following interfaces. In CentOS and other Red Hat variants, these configurations are split into separate files for each network interface and stored in /etc/sysconfig/network-scripts/. The default interface for internet connection is usually called eth0, open the corresponding configuration file. The configuration file for eth0 should look like this. If the interfaces configuration files do not match the example here, edit the file specific to your system to restore the original functionality. For any changes made to these files to take an effect, you must restart the interfaces to which the changes apply to as described previously with ifdown and ifup commands. When ping with an IP works, but the regular connection still fails, try pinging a domain name instead. For example, you can ping the UpCloud domain with like so. If the domain does not reply, the problem is most likely with the way your server resolves domain names to IP addresses. Check your server’s DNS records. The list should contain a minimum 1 name server. All default DNS resolvers at UpCloud have the same IP addresses regardless of the availability zone. The DNS servers are provided automatically by the DHCP protocol and there should be no need for manual configurations in the operating system. If the list is empty do not edit it manually, because if you have a nameserver manager installed any changes you make will just get reverted. Instead, on Ubuntu and some Debian systems, you can try to update it with this command. On Debian servers, which do not have resolvconf installed, you can edit the resolv.conf file directly. Add the lines shown below to the file, save and exit. Those with resolvconf installed, in case resolv.conf is still empty after the update command, you can add nameservers to your interfaces file. Open it for edit. Add a name server to the end of eth0 section. Afterwards, save the file and exit. You will also need to restart the network service with the following command. In CentOS and other Red Hat variants the resolv.conf file is populated a little differently, if the file is empty, you can add up to two DNS entries in your network configuration file for the network interface responsible for the public IP. For example, open ifcfg-eth0 it with the next command. Edit the file to look like this. Exit the editor and restart the interface which configuration file you just edited using ifdown and ifup commands. Try pinging your server over the internet. Open a terminal or command prompt on your own computer and try pinging your server’s public IP, which you can find in the UpCloud control panel under the Network section. Test the internet connection by pinging and another site from your server, for example, use the following command to ping Google’s public DNS. 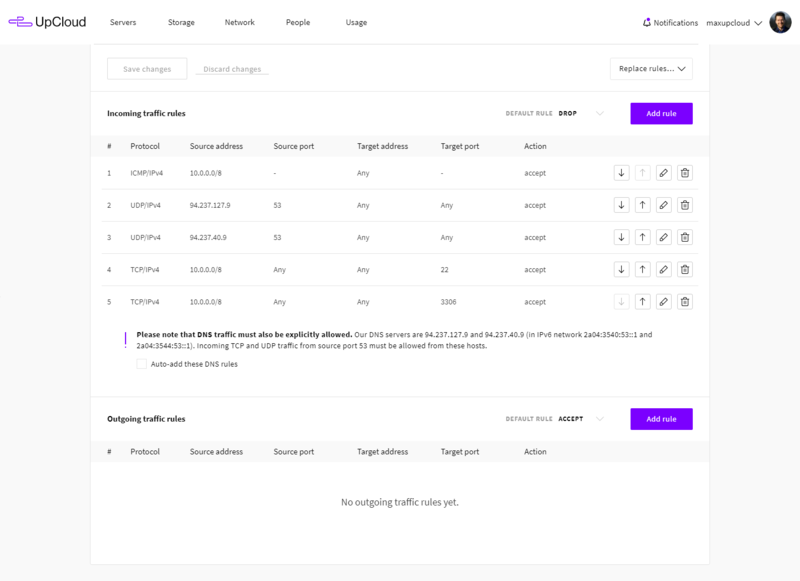 If you have a second server deployed on your account and the problem is with the interface assigned with the private IP address, try ping with your other server, to and from it, using the private IPs listed in the UpCloud control panel. Should ping fail to receive a reply, try restarting all of your server’s network services. In Debian and Ubuntu 12.04 or older, use the command below. On CentOS and other Red Hat based systems, restart the network with the command underneath instead. In Ubuntu 14.04 and newer you’ll need to run the command for each network interface separately, for example, you can restart eth0 simply with the following. After restarting the network services, try running ping again both ways. If ping works in one direction but not in the other, check your firewall settings. Your internet connecting in its basic form boils down to knowing the route to take to your destination. It is sometimes possible for the connection routing to hit a dead end, which then results as a failed connection. Run a route trace from your server to see at which network node the connection gets lost. Ubuntu servers have a networking tool called mtr for this purpose, start it with the following command. And to quit just press q on your keyboard. To do this on Debian systems where mtr is usually not installed by default, you can use traceroute instead. On CentOS servers use tracepath command. Different distributions run different tools and the output of these tools also differs slightly. The mtr runs on the foreground until cancelled, updating the response table on each pass, example output is shown below. Traceroute and tracepath are very similar to one another, they run pass over the network to the given destination and show the latency to each node that replied. Example of traceroute shown underneath has much of the same information as mtr. Try the same from your own computer to the server using one of the tools mentioned above, for example using the command below. If an outbound trace does not reach even the first node, check your network settings and firewall. The firewall may also be responsible for connection rejections if trace over the internet to your server falls short of just before reaching the server. Check that your connection is not getting blocked by a firewall. CentOS and some other Red Hat based distributions have strict firewall rules by default. The following command will list all server-side firewall rules on your system. Iptables is the Linux built-in software firewall, and the command above prints out the following. This is an example of a simple firewall table. It has rules to allow SSH and HTTP traffic, but block all other input, which also blocks ping attempts. Check your server’s iptable for any is shown that might block your connection. Your UpCloud control panel also provides an easily configurable firewall in your server settings under the Firewall tab. The example image above has a few accepted incoming rules, but the default rule is set to reject. Make sure there are no rules blocking your desired connection. Check the most up to date information on UpCloud infrastructure at status.upcloud.com, where you can also subscribe to updates by email, SMS, and Atom or RSS feeds. If everything seems to be in order, but the network connection still just doesn’t work, or you are otherwise unable to troubleshoot the connection issues, don’t hesitate to ask for help.